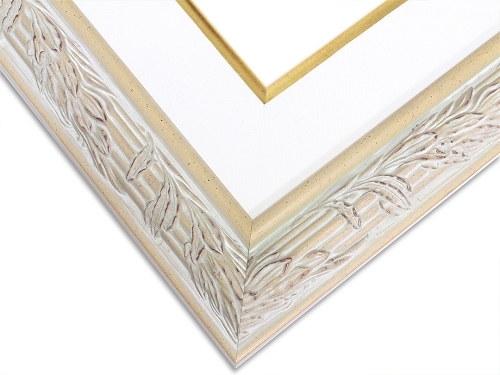 This frame featuring an ivory white leaf pattern with white patina is ideal for enhancing a subtle and tastefully decorated room full of light colors and lots of sunlight. The white linen liner and gold fillet make it perfect for filling the empty spaces along a room's walls without distracting from the main pieces of furniture and decoration. 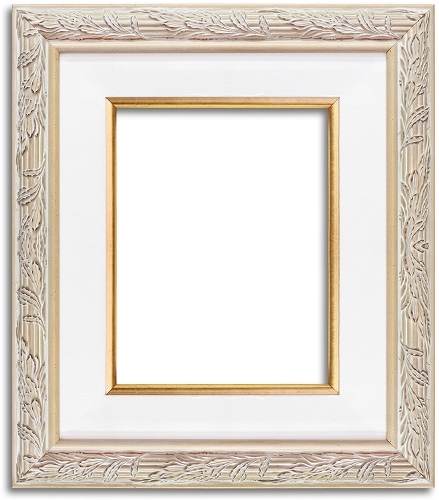 This reserved classic design means that this frame is most often used in a group to showcase a theme of pictures or images in one room that augment the room's existing decoration. Classic black and white family photos or a selection of art prints from a favorite artist or era are the perfect use for this tastefully designed frame. This frame is almost unique in the market for the contribution that it can make to the visual appeal of an appropriate living space.